Support for public lands isn't new among outdoor businesses, says John Sterling with the Conservation Alliance. But the industry is entering into the advocacy realm in a new way, in response to Trump Administration actions. Last spring, the outdoor retail industry had what you might call a moment of truth. The Trump Administration had its eye on national monuments. It looked as though the Interior Department could remove protections for several of them. “The proposal coming out of the administration was quite profound,” says Mark Bereka, director of government and community affairs for REI. His company and others reacted in kind. For the first time, REI made a national push to millions of members and customers asking them to submit comments against the plan. The outdoor co-op had been active on environmental issues in the past, but not on this scale. “I’d say we just turned up the dial a bit,” Bereka says. Outdoor clothing companies North Face and Keen also took a stand. 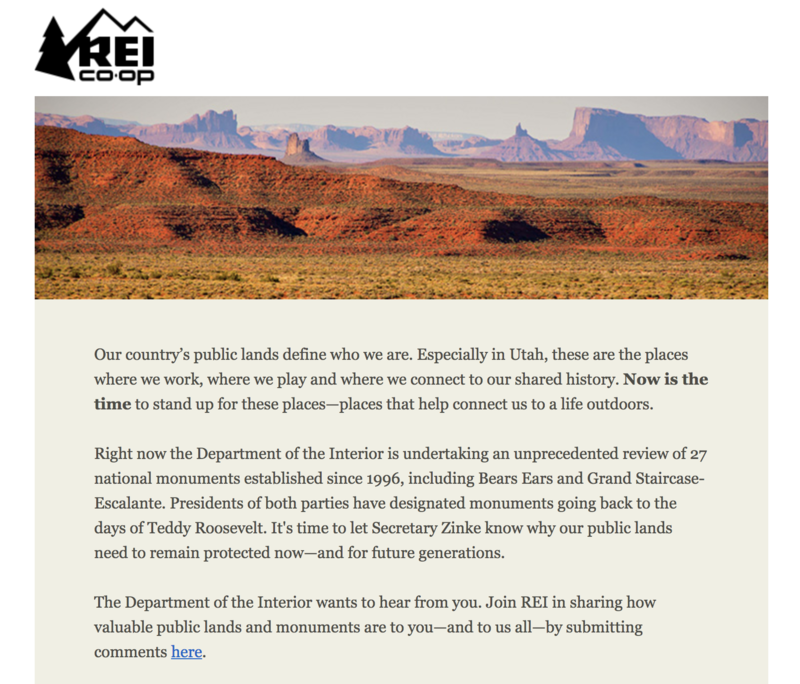 REI sent out a national action alert in to ask members to comment during the Trump Administration's national monument review period. It's common for outdoor companies to show their love for nature by supporting non-controversial efforts like trail maintenance or environmental education. But in the past two years the industry has been flexing its political and economic muscles at a whole new level. Leaders of the Outdoor Retailer Show abandoned Salt Lake City for Denver, in response to Utah leaders advocating for federal public lands to be transferred to states. The annual event generated $45 million in economic activity for the city. Outdoor retail giant Patagonia has perhaps taken the strongest stance against the administration. When the proposal to shrink two national monuments in Utah actually went ahead, the company sued the Trump Administration. John Sterling, who leads the Conservation Alliance, a nonprofit group that works with businesses to protect wild places and habitats, isn’t surprised by this. He says places like this are a testament to the economic importance of public lands. “Bend is a community that is growing and economically doing pretty well and a lot of that is dependent on public lands,” says Sterling. Outdoor businesses are also reliant on these lands. "It's part of the identity of the industry and of individual companies, and if you try taking that away they're going to respond," he says. The industry has also gotten more sophisticated in talking about its economic impact. The government measured the outdoor recreation industry’s economic footprint for the first time ever earlier this year. The Bureau of Economic Analysis reports the industry is worth about $374 billion dollars, or about 2 percent of the entire GDP. That’s more than the oil and gas industry. The Outdoor Industry Association touts an even higher number— some $887 billion in consumer spending. Sterling says the surge in email alerts, social media activism and donations to environmental advocacy groups aren’t actions companies take lightly. “Anytime a company sticks their neck out on an issue that could stir up some controversy, they have to think about how that affects their brand,” says Sterling. Patagonia, at least, has never been one to fret about how the company’s activism affect profits (although founder Yvon Chouinard has said publicly that whenever he stands up for his values, sales improve). But can outdoor giants reach beyond their base, which is often seen as well-to-do liberals who live in urban settings? 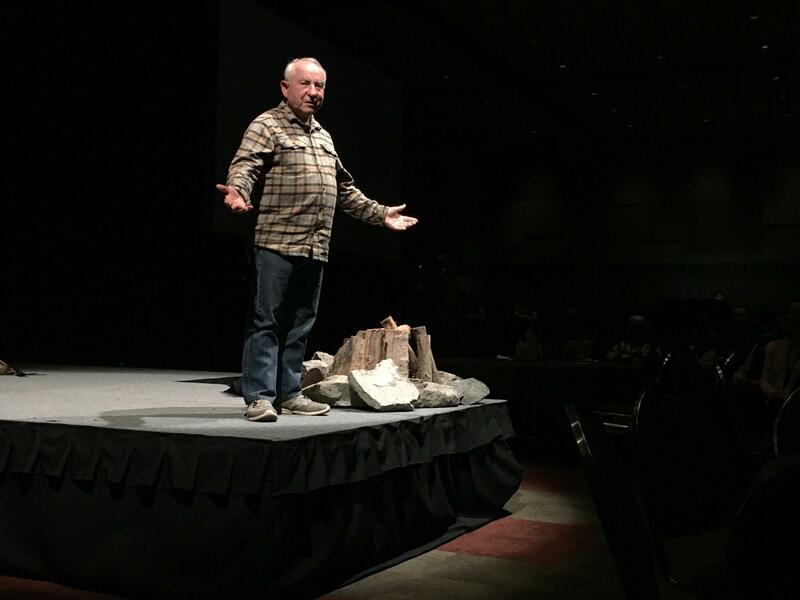 Patagonia founder Yvon Chouinard was a featured speaker at the Backcountry Hunters and Anglers rendezvous in Boise. "If you want to get something done, you need a large coalition of people," says Patagonia’s Corley Kenna. She sees public lands conservation as a bipartisan cause, and the company is now working with sportsmen on public lands campaigns. "We were thinking, 'Who else would be as dedicated to this cause?'" With that in mind, Patagonia founder Yvon Chouinard was a guest speaker recently at an evening campfire stories event hosted by nonprofit Backcountry Hunters and Anglers. Across the West, hunters tend to lean conservative, and BHA’s members do too, according to the nonprofit’s own surveys. Chouinard’s progressive and unrelenting views on conservation were well-known and in the crowd, and still he got a standing ovation. 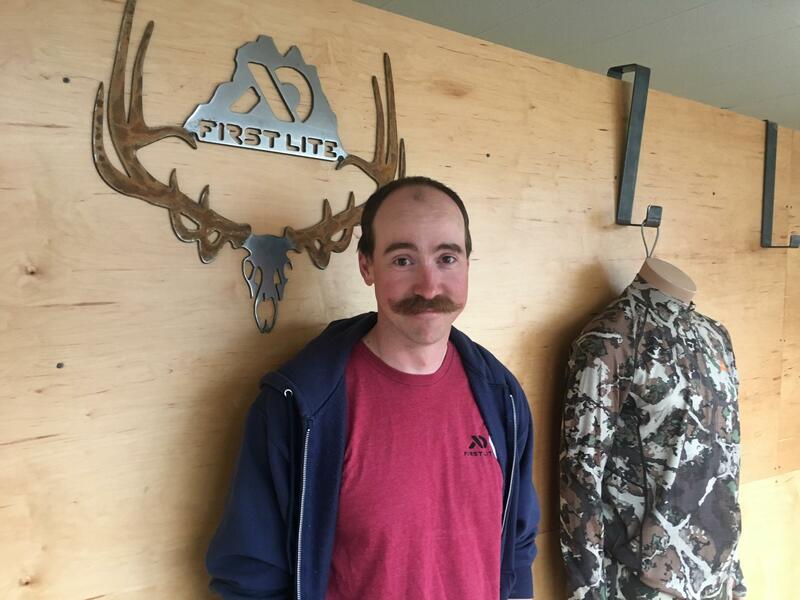 None of this surprises Ryan Callaghan, with First Lite, an Idaho company that sells high-end hunting clothes. 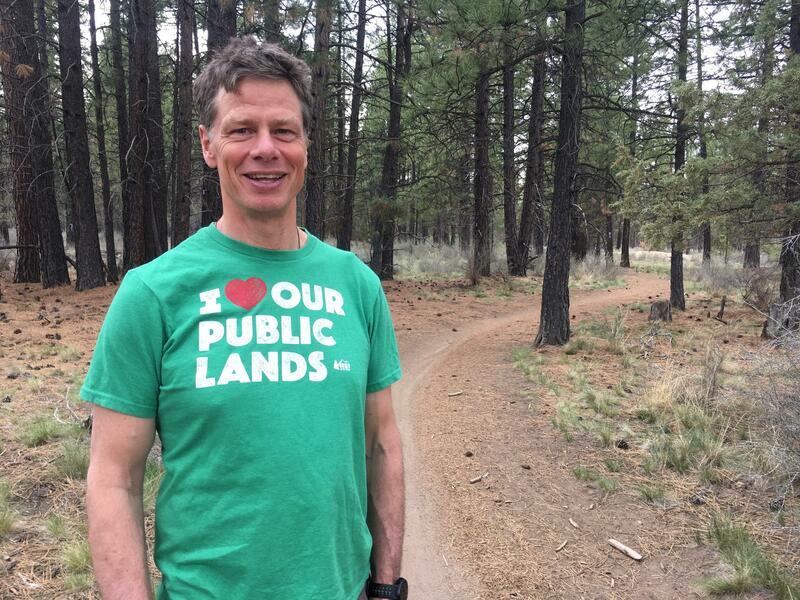 He says conservatives are just as passionate about public lands as progressives. "Just because you have an 'R' behind your name doesn't mean that you don't care about the mountain," says Callaghan. First Lite worked with Patagonia on the monuments campaign. “We get a tremendous amount of support when we put out calls to action on these issues,” Callaghan says. And, he says, the calls to action are good for the company’s bottom line. He gets floods of emails whenever First Lite promotes public lands advocacy. "Everybody’s saying, 'This is exactly why I buy from First Lite.'" Ryan Callaghan says public lands advocacy is not only the right thing to do for First Lite, it's also attractive to customers. This approach may be good for a politician’s bottom line, too. Candidates supporting public lands access seem to be doing well in the Rocky Mountains. Take the 2016 win of Montana governor Steve Bullock, or Republican Raul Labrador. The Congressman got a 0 percent score from the league of conservation voters. Labrador was just defeated in Idaho’s gubernatorial primary in favor of Brad Little, who tows a more moderate line on public lands issues. But is this new wave of business activism making a tangible difference? In some regards, yes. In others, no. REI and Patagonia alone helped generate about 200,000 public comments during the national monuments review process-- about 7 percent of the total submitted. But the Trump Administration still shrank Bears Ears and Grand Escalante National Monuments despite the majority of public comments that opposed removing protections. But more recently, the Interior Department backed off its idea to increase fees at National Parks. That was another issue the outdoor industry rallied around. And last year, former Utah Congressman Jason Chaffetz withdrew legislation that proposed transferring federal lands to states, after he was hammered with opposition from sportsmen and other groups. What the industry still lacks is lobbying weight. According to the Center for Responsive Politics, which tracks money in U.S. politics, the outdoor apparel and gear industry is far outspent by other industries that lobby for political influence. “Look, we’re not a rich industry even though we generate a lot of economic activity,” says Mark Bereka with REI. He says his industry has something that the pharmaceutical or automotive industries don’t have: a loyal customer base. "We've got real Americans with real points of view on the importance of getting outdoors," Bereka says. Roberts with the Outdoor Industry Association points out that the outdoor recreation industry is still relatively young. Many of these companies have been around for decades, not centuries. “I do think the industry is maturing in terms of our political advocacy. We’ve been engaged in political affairs for 20 years, but being able to talk about the recreation economy has been a turning point. Roberts says she’s excited about the industry’s heightened profile and the level of engagement from businesses. Now that a National Parks entrance fee hike is on hold, competing legislation is floating through Congress that would permanently pay for the multi-billion dollar maintenance backlog using federal mineral revenues.